home > Bradbury > Bradbury kitchen specification. Cooking and heating of food. Catering items - additional charge. 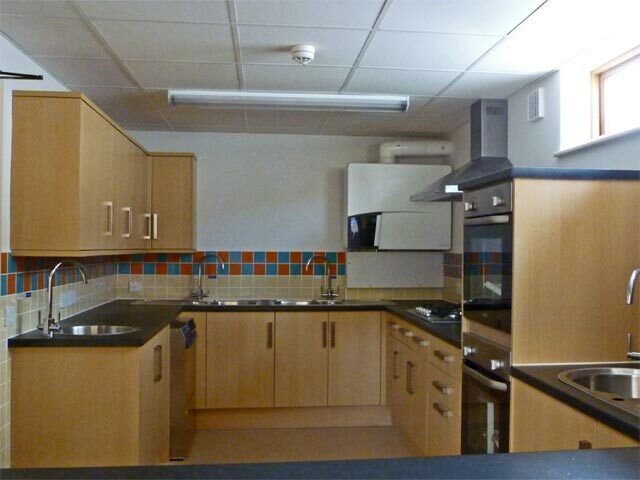 The Kitchen is part of a new building that was constructed in 2010 to a very modern design which fully complies with all the latest safety, sustainability and disability requirements. There is a serving hatch into the Bradbury Hall and easy level access to the street, Bradbury Hall, Meeting Room, Coffee Bar and the Church. Width - 2.7 metres (9 feet). Length - 4.3 metres (14 feet). Height - 2.3 metres (7 feet). Usable Floor area - 6.25 square metres (67 square feet). The kitchen is accessed from the main entrance lobby via a single door. There is a serving hatch between the Kitchen and the Bradbury Hall with a roller shutter. Access from the Main Hall is via a set of double doors in the lobby. Full coffee making facilities are provided, but we do not provide the milk or coffee! Kettles are not provided and must not be used in the kitchen. There is a coffee making area within the kitchen adjacent to the serving hatch. There is an automatic water heater capable of providing instant hot water for up 240 mugs of tea or coffee or 360 cups per hour. A separate sink is provided in the Coffee area for the emptying of cups and for hot and cold water. Cafétiers (12 cup) - 2. Selection of cutlery, bowls, jugs and plates for serving milk, sugar and biscuits. 2 fan assisted electric ovens. A 1000 watt commercial microwave oven. A fridge is provided for the temporary storage of food during your event. Selection of food preparation and serving cutlery. A commercial dish washer is provided with a 2 or 3 minute wash cycle. This machine will work continuously all day, after an initial warm up time of 15 minutes Detergent and rinse-aid for the dishwasher is provided which is via an automatic feed. There is a continuous supply of hot water available at the main sink for the washing of dishes but we would prefer you to use the dishwasher at all times. Washing up liquid and drying cloths are provided. There is a separate hand wash basin with a soap dispenser for the washing of your hands during food preparation. A First Aid Kit suitable for Kitchens is supplied. There are 5 x Double 13 amp Socket Outlets positioned around the Kitchen. Basic kitchen cleaning materials are provided. Separate bins are provided for the re-cycling of as much waste as possible. There is manually operated window to provide natural ventilation. A cooker hood with extract fan is provided for forced ventilation. Heating is provided via a fan assisted radiator which will maintain a constant temperature of 20°C. The heating, if required, is automatically activated upon first entry to the Kitchen.